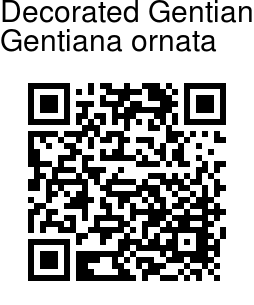 Decorated Gentian is a perennial herb 4-7 cm tall. Stems are ascending, simple, hairless. Basal rosette leaves developed; leaf blade linear, 1.8-3.5 cm × 2-4 mm, base fused for 2-4 mm, margin scabrous, tip tapering, midvein distinct. Stem leaves larger, more crowded toward tip, uppermost surrounding calyx; leaf blade base blunt and fused for 1.5-2 mm, margin scabrous, tip pointed to blunt, midvein distinct. Lower stem leaves elliptic to ovate, 3-7 × 1-2.5 mm; middle to upper leaves linear, 0.8-1.5 cm × 1-1.5 mm; rarely all stem leaf blades linear to narrowly elliptic. Flowers are borne singly at branch-ends, without stalk. Calyx is narrowly obconic, 1-1.3 cm; sepals green, linear, 0.9-1.1 cm, margin scabrous, tip blunt, midvein distinct. Flowers are pale blue, with pale yellow-white base and dark blue streaks and spots, bell-shaped, 2.5-4 cm; petals broadly triangular, 2.5-3.5 mm, margin entire, tip blunt and sometimes mucronate; plicae ovate, 0.5-1 mm, margin entire, tip blunt. 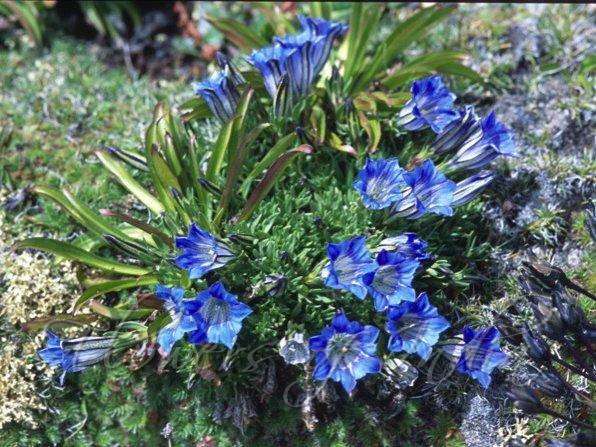 Decorated Gentian is found in Eastern Himalayas, from Nepal to Sikkim, SE Tibet, at altitudes of 3400-5500 m. Flowering: August-November. Identification credit: Bharat Kumar Pradhan Photographed in North Sikkim.